You see them turning their head when in a conversation or using one ear predominantly when on the phone—and it is not the ear you would anticipate given their dexterity. You find them asking others to repeat themselves or speak up during a conversation. They have difficulty keeping abreast of a conversation when there is a lot of background noise. They hesitate when invited to social events or outings, and you find them staying home and keeping to themselves more often than usual. You find them focusing on your lips when you are speaking to them. Hearing aids have come a long way since their advent. Today, there are numerous styles and designs. Some are designed to limit background noise. Some are placed entirely in the ear while others are worn behind the ear. 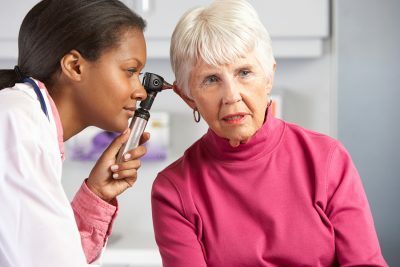 An audiologist can help you and your loved one determine which type of hearing aid is best for their specific needs. They will also need to rule out specific causes of hearing loss such as diseases like Meniere’s or autoimmune inner ear disease, excessive ear wax and tinnitus. It may take some time for your parent to become accustomed to using a hearing aid. They are usually happy about the prospect of being able to hear better and not having to ask everyone to repeat themselves. There are, however, those that find them cumbersome and refuse to wear them, finding the initial getting use to stage annoying and frustrating. It is important for your parent to maintain an active social life and enjoy companionship. To this end, a home care provider can help them by providing support during their time of adapting to their hearing aid. It can take up to four months for them to become use to the new device. In that time, a home care provider can take time to speak with them—slowly increasing background noise. All sounds will seem loud at first, including background noise. Letting your parents know that adapting to their hearing aid will require some patience and then giving them the support to achieve it will, in the long run, help them live a productive and confident life. If you or an aging loved one are considering home care in Old Bridge Township, NJ, please contact the caring staff at Lares Home Care 888-492-3538 or 732-566-1112.